The Editorial Service of the Vaishnava Acharyas inform about several preaching events which took place last week and the visit of a prominent devotee, too. On Wednesday August 10th, a great festival was held at Seva Mandir in Bogota, Colombia Yatra. Kicking off the Festival of Sri Sri Radha Govinda Julan Yatra, the devotees of Sri Chaitanya Mahaprabhu Seva Mandir enjoyed the visit of Deena Bandhu Prabhu, a great devotee who is a very dear friend and spiritual brother of Srila B.A. Paramadvaiti Swami, who has personally asked to give a very warm welcome in Colombia to this special guest. Here is a brief biography. In 1969, a couple of months after his 20th birthday, during the festival of Janmastami, Deena Bandhu Prabhu visited the ISKCON temple in Boulder, Colorado, and met His Divine Grace Srila Prabhupada. 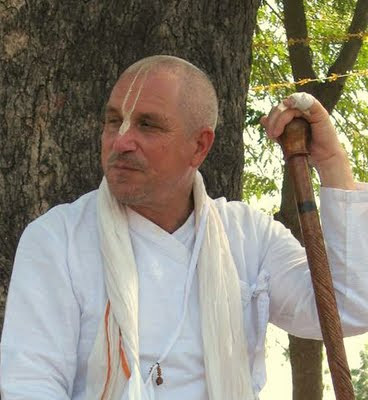 And he was instructed by him, Deena Bandhu Prabhu stayed in the temple and never left. On January 25, 1970, Srila Prabhupada gave him spiritual initiation in the same temple. 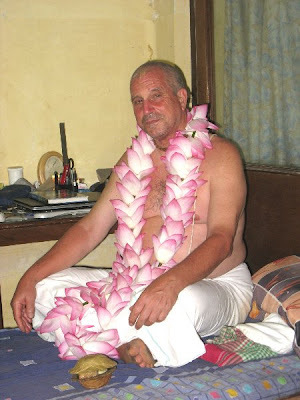 In 1984, he came to Vrindavan and stayed there for the last twenty seven years. His holy presence in Bogota was a great blessing. Servicio Editorial de los Vaishnavas Acaryas, ki jay!